Captain Joy booked his ticket to All-Weather Championships Finals day with a determined victory in the Sun BETS Race at Dundalk. 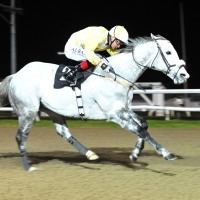 Successful in the Mile event at Lingfield's Good Friday showpiece in 2016, Tracey Collins' gallant grey will be heading back there after this 10th career win - eight of which have come at Dundalk. The 7-2 chance tracked the front-running Geological until heading inside the final quarter-mile and picked up really well for Pat Smullen to dispose of Beach Bar by three-quarters of a length. Collins said of her nine-year-old: "He's a star. He's a very genuine, consistent horse and I must say Hazel (Wallace) looks after him and she does a super job. She rides work for us, she drives the box - she's a great girl. "She's done an awful lot of work with him and he takes a lot of work. He's getting that bit older now that he takes a little bit more. "If they were all as honest as him life would be very easy. He was off the track for a long time and has come on well from the run the last day. "Not too many have won three qualifiers and he'll go straight to Lingfield now." Smullen had earlier been on the mark with the Mick Halford-trained newcomer Karakour (7-1) in the Meridian Security Ltd Maiden. Halford said: "I was delighted with him - he's a very green horse and it's a lot to ask first time out from a wide draw. Pat did really well to get a good position on him, and when he was challenged he tried really hard. "There is a lot of improvement in him - he's a typical Aga Khan horse as he's lazy at home but he did well to rally back. "I didn't think he was sharp enough on his home work to win first time out so he's done well to win."